Initially, I was worried that these boots would only pair with skirts or dresses, but they fit over skinny jeans just fine! And they look great with tights, too. They really make your legs look a mile long, which is never a bad thing! For the comfort and quality at the price, they’re the best that I’ve found on the market right now. When I was searching for heeled boots and booties, I had a hard time finding a heel under 4″. 4″ is typically my rule… I know I won’t end up wearing them if they’re uncomfortable to stand or walk in! These OTK boots measure in at 3.5″ and they’re just right! Since over the knee boots, bare legs, and a skirt can look a little flashy, I made sure to cover up on top. 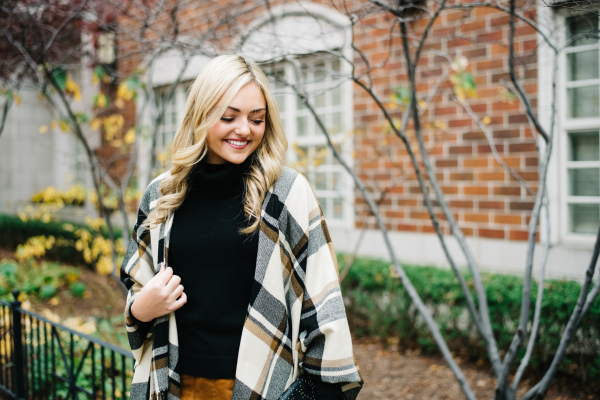 A trusty turtleneck and a plaid poncho make this outfit feel daytime appropriate! However, I’d definitely add tights for any type of work environment just to be safe. 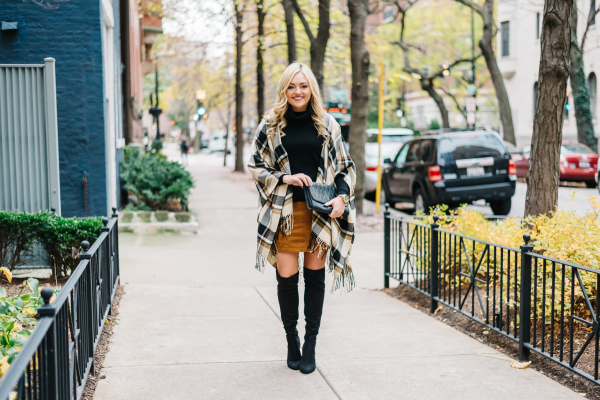 PS: The suede skirt I’m wearing is on sale for Cyber Monday! (Use code BESTCYBER for 40% off!) You can see how I last styled it here. I love it so much how perfect the cape is matching with the overknees and the skirt! Such a pretty and stylish outfit! Your cape and boots are simply perfect! I have the Stuart weitzman version and I’m absolutely in love with them!! Glad you were able to find a similar pair! Love this look! I ALWAYS wear OTK boots as pants 😉 They’re great! 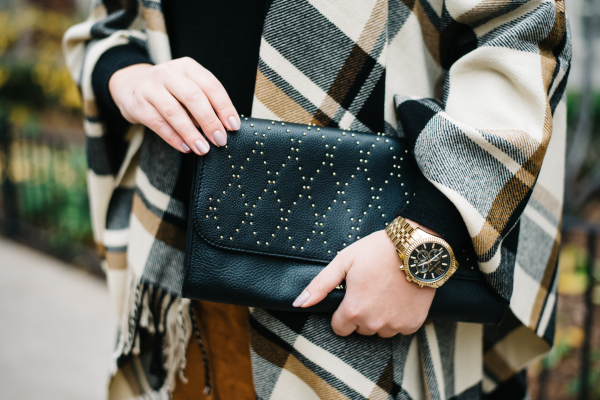 Such a stunning neutral outfit! Love this from head to toe! I love this skirt! seriously so cute! I love this look! 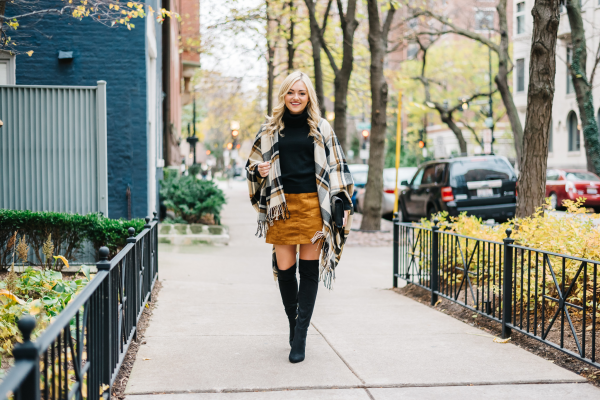 The colours in it are so perfect for Fall & you’ve totally toned down the OTK boots with the poncho! Plus that skirt is seriously fab! My mom got a pair of over the knee boots from Ivanka Trump, and they are gorgeous. I think many of her shoes look more expensive than they actually are. Your boots are stunning! Cant believe that skirt is from Old Navy, love it! Your boots are impeccable! I love everything about this outfit! I’ve been lusting over those Stuart Weitzman boots for so long, but can’t justify the price for all the walking I do in Colorado too. These Ivanka Trump over the knee boots might just be the perfect compromise. They look so chic on you and make your legs so long! Great find, Jess! Thanks for sharing, girl. Obsessed with this look! Just bought a pair of OTK grey boots from Forever 21 and they’re awesome, though love this heeled version.